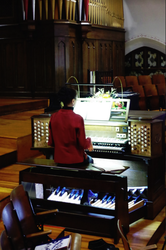 Karen Beaumont is an active organ recitalist and organ and piano instructor. She also plays the French Horn. From November, 1988 through April, 2011, she provided the organ and choral music at St. James Episcopal Church in Milwaukee, Wisconsin. She holds a degree in Music History from the University of Wisconsin-Milwaukee. Other Cities in the U.S.A.